If you have a Huawei P10 in your phone arsenal, it’s time to go check for an update. The Chinese manufacture has begun rolling out a new update that brings a host of improvements as well as an updated security patch. The update is version VTR-L09C432B123 (if you have the dual-SIM model, it will be VTR-L29C432B123) for those keeping score and is 467MB in size. You will want to make sure you are connected to Wi-Fi before downloading it and once you do have it, expect about a 5 minute install time. If you are curious about the Huawei P10, you can read my review and even though I have a Pixel XL, I still find myself using this phone more than any other phone. The camera performance for the P10 has been improved with this update as Huawei has optimized the software running it. The overall system stability has also been improved although frankly, I’ve never had a stability issue with this device in the previous build. Huawei has also optimized the touchscreen sensitivity which is noticeable if you use the P10 as your daily phone. It is more accurate and responsive now. There are no major updates to the Android Nougat based EMUI 5.1 in this update. It is still based on Nougat 7.0 although rumors persist that 7.1 is coming soon. That remains unofficial but it would be great to see the P10 and P10 Plus see the latest version of Nougat. 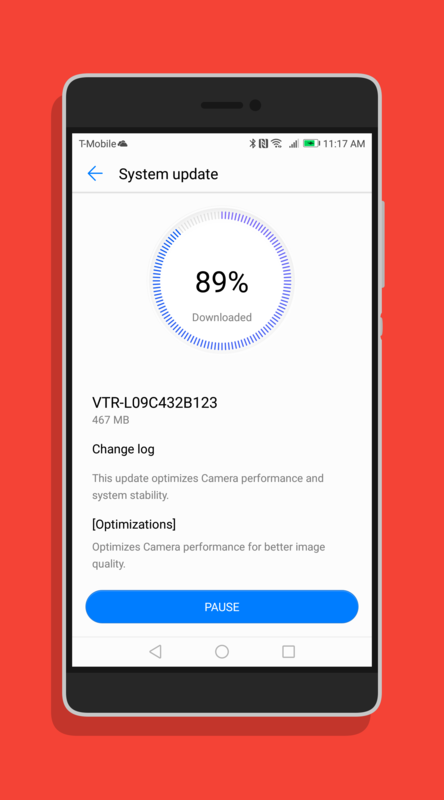 The software update for the P10 is rolling out now. To check for it, go to Settings>System update and tap the Check for Updates button. If it is ready for your phone it will download and install for you. The Huawei P10 is slated to come to Canada soon and the US later, likely under a different name. If you want to pick one up now, you can via Amazon starting at $615. I highly recommend it.